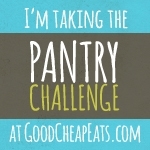 I’m participating in a two week Pantry Challenge with Good Cheap Eats. I do this to use what we have on hand, reduce waste and hopefully save a little money. Contrary to what my Teens will think at the end of the Challenge, I am NOT doing this to torture my family. You can view all of my Pantry Challenge posts HERE. Day Two was a mixed bag, but it is what it is. Here’s the low down on how the meals went down. Breakfast – Pizza for The Boy, toast for me and nothing for The Girl (I think she was too nervous to eat before her first day of volunteering at Chip). Lunch – Once again, I have no idea what they ate during the day. They are Teens, so I’m confident they didn’t go hungry. Late Lunch/Pre-Dinner – I have no idea what to call this “meal” but there was a decent amount of eating going on at 4:30 p.m. Ham & Cheese sandwich for The Boy, leftover Malibu Melt Wrap for The Girl and I had a leftover Chicken Tinga Tostada. I still have quite a bit of Chicken Tinga meat leftover so I think I’ll freeze some for a later meal. While it may seem counterproductive to a pantry challenge, it’s better than wasting the meat. I’ve posted my modified Chicken Tinga Tostada recipe HERE. Late Dinner – The Boy and HH had Wendy’s after football. HH said The Boy was “starving” after football (it was 9:00) and he caved to fast food when he realized The Girl and I were at the movie. Snacks – mango smoothies, fruit, cheese, movie theater popcorn. So, are you ready to join the Summer 2014 Pantry Challenge? If you are, I would love to hear about your progress. Post your progress or any questions you have in the Comments. I’ll do my best to answer. Happy Eating!!! This post contains affiliate links. If you choose to click on the link and/or make a purchase, I will be paid a small amount which helps to support this website. Your price is the same, whether or not you use the link. This does not influence or change my opinion.